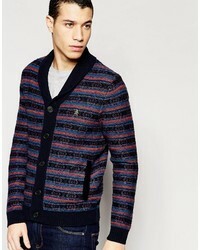 Marry a navy print shawl cardigan with grey chinos if you seek to look casually cool without much work. 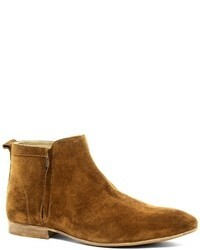 Tone down the casualness of your getup by finishing with a pair of tobacco suede chelsea boots. 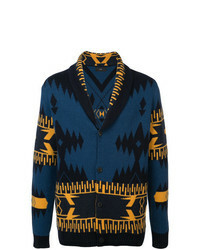 Marrying a navy print shawl cardigan with a navy denim shirt is a great pick for a casually dapper getup. 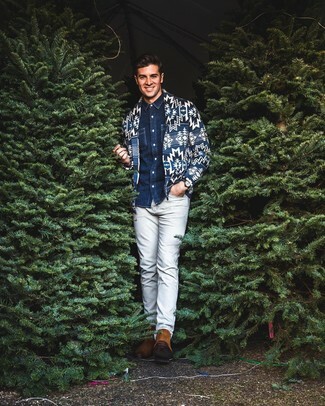 And if you want to effortlesslly elevate your outfit with a pair of shoes, complement this outfit with tobacco suede chelsea boots. 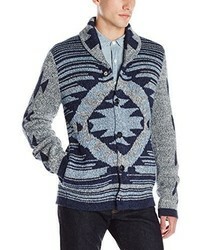 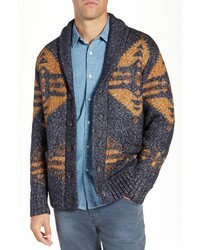 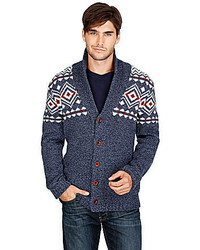 Schott NYC Geo Pattern Cardigan $160 Free US shipping AND returns! 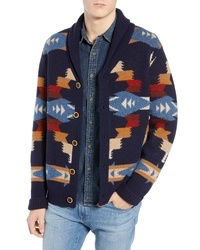 Pendleton Tucson Lambswool Cardigan $199 Free US shipping AND returns! 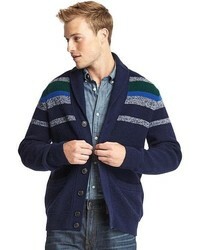 Alanui Shawl Collar Cardigan $2,199 $4,397 Free US Shipping! 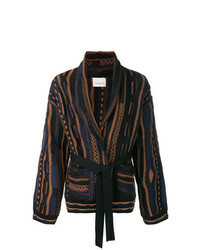 Laneus Open Cardigan $529 $661 Free US Shipping! 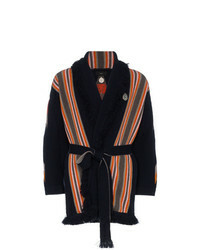 Alanui Cashmere Kaftan Cardigan $3,450 $5,750 Free US Shipping! 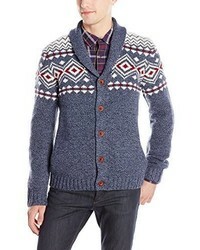 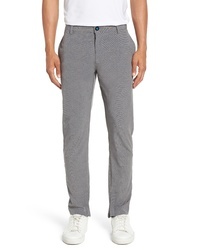 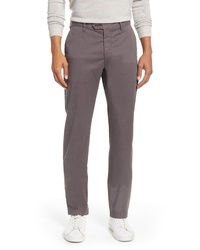 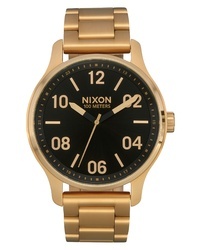 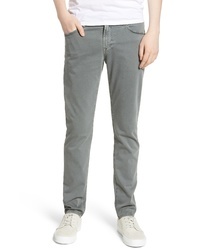 Original Penguin Knitwear $45 $105 Free US Shipping! 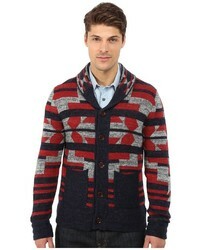 Consider teaming a navy print shawl cardigan with a navy denim shirt for both dapper and easy-to-wear outfit. 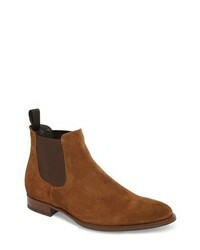 Our favorite of a myriad of ways to round off this getup is tobacco suede chelsea boots. 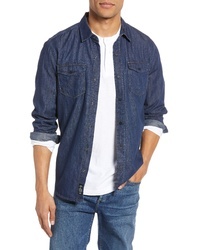 Mavi Jeans Rio Deep Brushed Denim Shirt $88 Free US shipping AND returns! 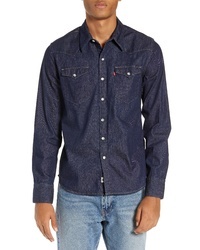 True Religion Br... Carter Distressed Denim Shirt $159 Free US shipping AND returns! 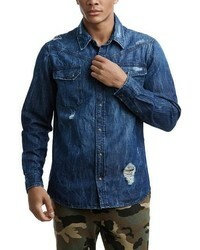 True Religion Br... Carter Distressed Denim Shirt $106 $159 Free US shipping AND returns! 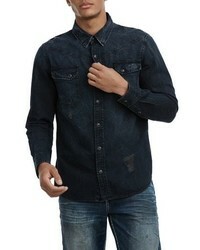 Levi's Barstow Denim Western Shirt $69 Free US shipping AND returns! 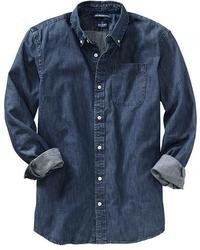 Billy Reid Distressed Denim Western Shirt $195 Free US shipping AND returns! 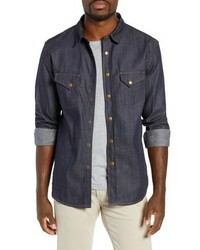 PS Paul Smith Denim Shirt $195 Free US shipping AND returns! 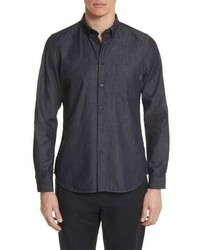 Boglioli Trim Fit Denim Sport Shirt $345 Free US shipping AND returns! 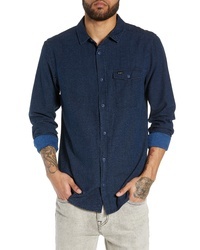 RVCA Honest Denim Sport Shirt $25 $65 Free US shipping AND returns! 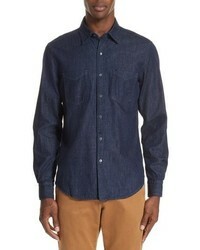 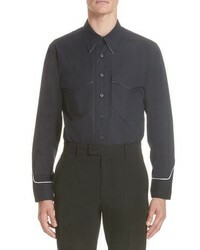 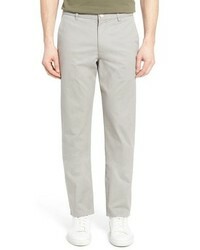 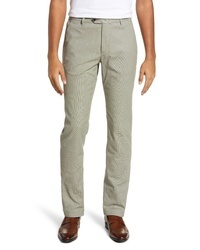 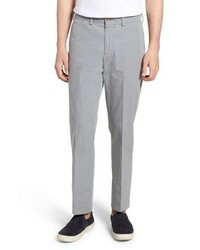 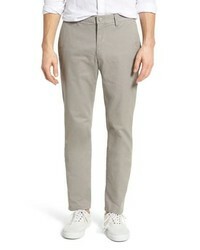 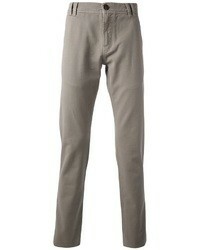 Calvin Klein 205... Western Detail Shirt $890 Free US shipping AND returns! 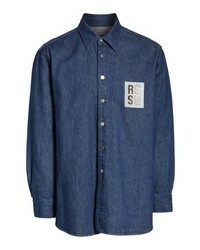 Raf Simons Carry Over Denim Shirt $753 Free US shipping AND returns! 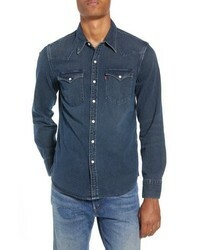 Levi's Barstow Western Denim Shirt $69 Free US shipping AND returns! 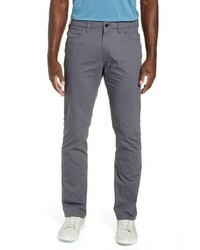 This pairing of a navy denim shirt and grey chinos is an interesting balance between practical and stylish. 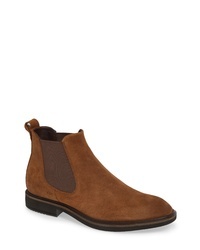 If you want to effortlesslly bump up your ensemble with a pair of shoes, why not introduce tobacco suede chelsea boots to this ensemble? 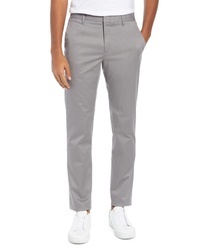 This casual pairing of a navy denim shirt and grey chinos is very easy to throw together without a second thought, helping you look sharp and prepared for anything without spending too much time combing through your wardrobe. 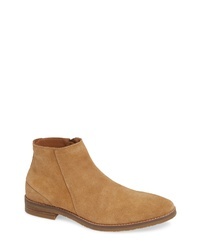 If you want to feel a bit more refined now, introduce tobacco suede chelsea boots to the mix. 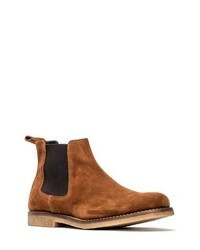 Jump Brighton Chelsea Zip Boot $112 $188 Free US shipping AND returns! 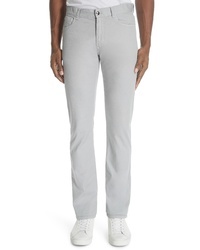 Ecco Vitrus Ii Chelsea Boot $200 Free US shipping AND returns! 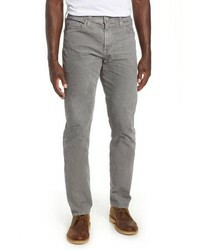 John Varvatos Co... John Varvatos Fleetwood Classic Chelsea Boot $698 Free US shipping AND returns! 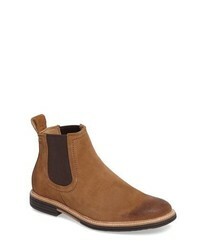 Kenneth Cole New... Hewitt Chelsea Boot $99 $150 Free US shipping AND returns! 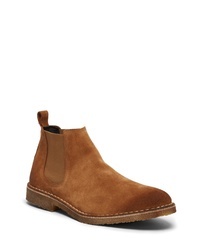 UGG Baldvin Chelsea Boot $200 Free US shipping AND returns! Ted Baker London Saldor Mid Chelsea Boot $265 Free US shipping AND returns! 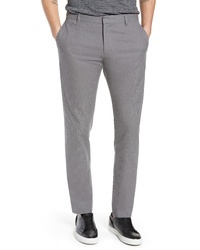 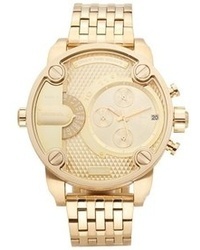 Calvin Klein 205... Cal Clute Boot $1,295 Free US shipping AND returns! 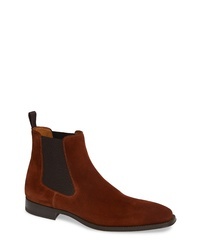 Magnanni Sean Chelsea Boot $174 $350 Free US shipping AND returns! Rodd & Gunn Gertrude Valley Water Repellent Chelsea Boot $298 Free US shipping AND returns! 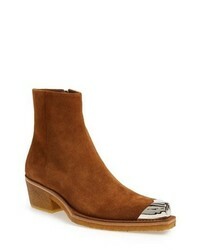 To Boot New York Shelby Mid Chelsea Boot $398 Free US shipping AND returns! 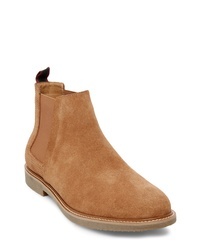 Steve Madden Highlyte Textured Chelsea Boot $99 Free US shipping AND returns!